Unmarried girls used to go around banging spoons on pots and asking for a change to their fortune (ideally, a husband). Nowadays, it is sweet-toothed children. You might be thinking of the similarities with Halloween (children asking for treats), Wassailing (banging pots to ward off evil spirits) and Chinese New Year (significance of red, firecrackers): well, you are right. The observance of equinoxes, solstices and other goings on in nature seem to be universal to humankind. Arbitrary lines on maps don’t alter the fact that we are all the same. In human history, invariably pagan festivals have been altered to religious traditions. For example, in Northern Europe, the feast of St John (mid summer solstice) was marked by building fires to ward off evil: people partied and, yes, jumped over them! No matter the weather or where I am in the world, on the eve of the last Wednesday before the vernal equinox, and Nowruz I leap into the new year. 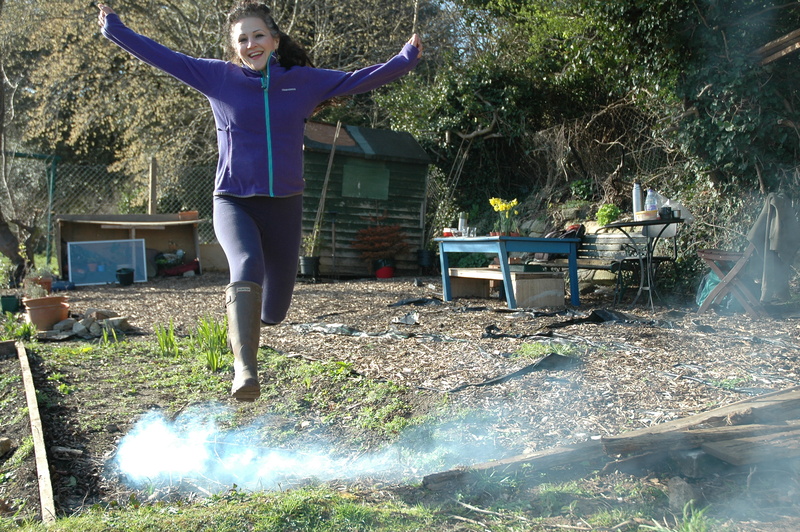 In the photos below: jumping indoors as it was raining, yesterday at our little allotment and a few years ago on holiday in France. All this fire making and jumping makes us a bit peckish so to snack we mix a bowl of trail mix know as Ajil. 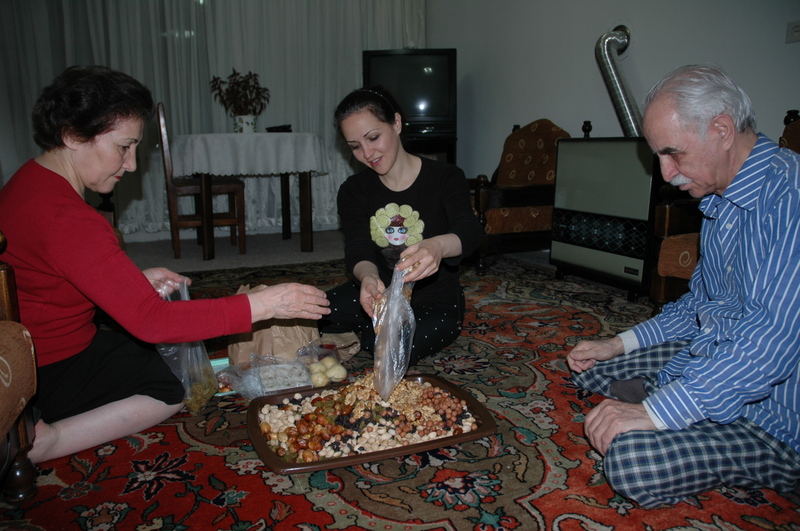 The ajil chaharshanbeh soori in farsi and akhir chaharshanba yemish in azeri is usually made with unsalted dried fruit and nuts. The mix will vary in different homes and regions of Iran depending on what is grown locally. We are lucky as we have relations with vineyards and orchards so mum mixes various homegrown sultanas, raisins, currants, figs, apricots, with walnuts, pistachios, almonds, hazelnuts, etc. We buy stuffed dried pears and peaches known as mianpour; also, there is soojugh and baslugh nuts cooked in grape syrup, rather like turkish delight. 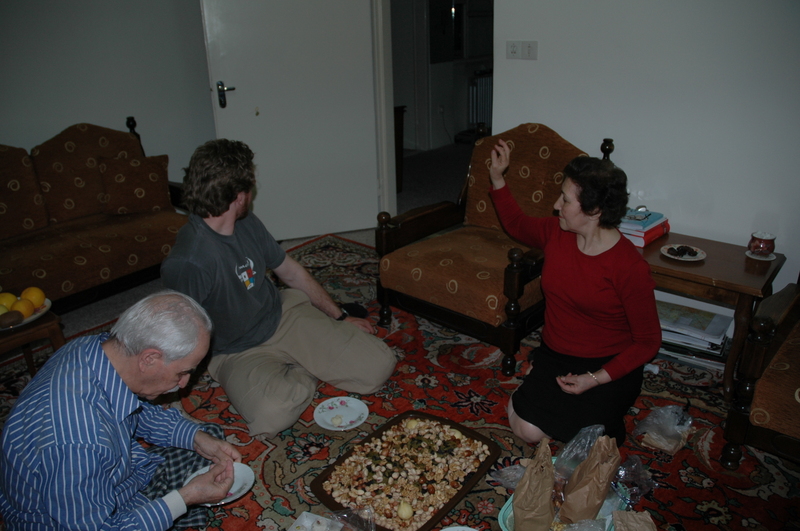 The last time I was in Iran for Nowruz, my father was alive and we mixed the Ajil together. In our family, there is also the tradition of throwing a few nuts into the corners of the room as a token of future prosperity and providing an unexpected treat! To finish this blog, I leave you with the first poem I learnt in farsi by Saʿdī, a 13C poet. It happens to be the over door in the Hall of Nations at the UN. What are your family traditions and celebrations? Please let me know via the comment box below. Merci and a rosy glow to you all. Kind of you to say Fae. I’m still trying to figure out how to draft blogs,edit and post. 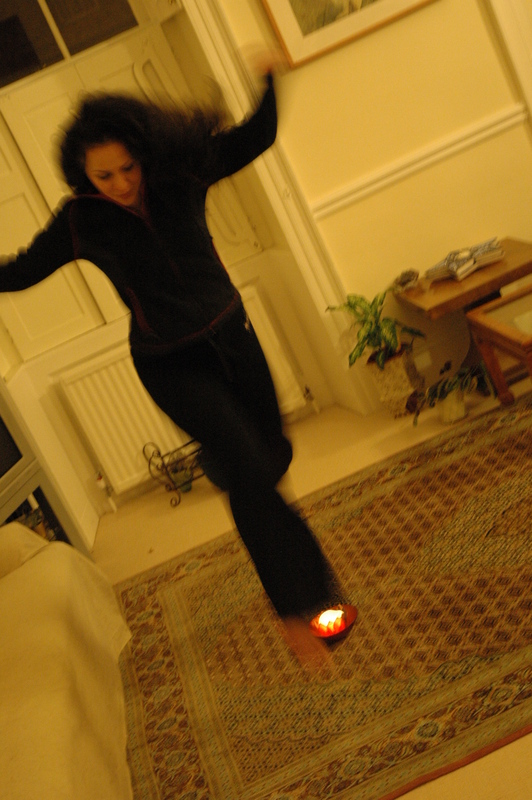 V exciting now as tomorrow is Nowruz! Bakht is luck. 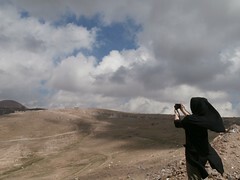 Bakhtim in Azeri is: my luck. Thanks, I have been searching for facts about this subject for ages and yours is the best Iíve discovered so far.